University of Arizona faculty, staff and students battled cowboys and zombies, rose high above the MMT Observatory on Mount Hopkins, and toured Chaco Canyon this summer – all from the air-conditioned comfort of the Science-Engineering Library. Their adventures, a mix of virtual and augmented reality, were part of the UA's inaugural VR Summit, held Aug. 4 and 7 to bring researchers and students together for demonstrations and discussion on the state of technology and its use as an instructional tool. "The use of VR in the classroom presents a tremendous opportunity for pushing the boundaries of interactive learning and offers our students and faculty exciting new avenues for interdisciplinary engagement and content creation," said Kimberly Andrews Espy, the UA's senior vice president for research. The summit was co-sponsored by University Libraries; University Information Technology Services; Research, Discovery and Innovation; and Academy for Defense Intelligence of the Defense Intelligence Agency, and also included innovators in the industry such as LookingGlass, Taqtile, Galatea and Intero, a locally owned Tucson-based business. 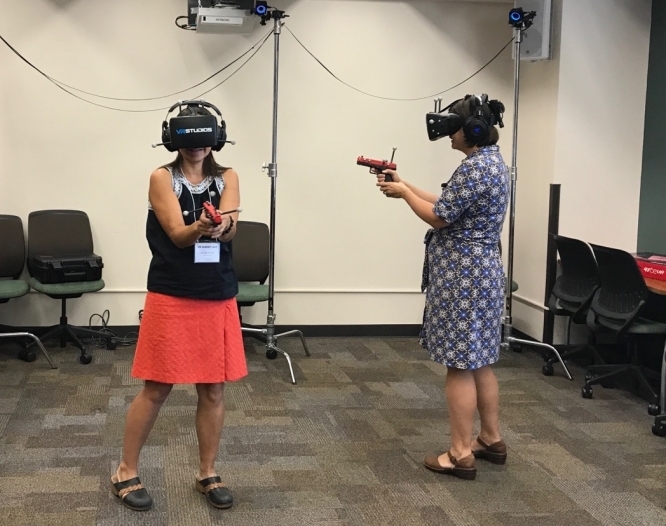 The VR Summit, which was held in the Science-Engineering Library, took advantage of the existing VR Studio and iSpace, a permanent on-campus hub for students, faculty and community members interested in exploring these new technologies. Austin Yamada, director of the UA Defense and Security Research Institute, is confident the University is well-positioned to be a leader in the virtual reality realm. "Virtual and augmented reality is here to stay," Yamada said. "Our goal is to facilitate partnerships between academic, industry and governmental organizations so we can play a fundamental part in driving the development and use for the future." More than 250 people attended the event, many donning headsets and earphones that transported them into a different world through the immersive effect of virtual reality, augmented reality and 360-degree video. The summit also offered two Q&A panel discussions with faculty, users and industry experts, including: Bryan Carter, Africana Studies Program and the Center for Digital Humanities; Joe Farbrook, School of Art; John Grant, Defense Intelligence Agency; Lloyd LaComb, College of Optical Sciences; John McBride, LookingGlass; Young Jun Son, Department of Systems and Industrial Engineering; Praise Zenenga, Africana Studies Program; and Samantha Rodriguez, an undergraduate studying illustration in the School of Art. A central theme emerged in the discussions: content creation, as opposed to technology advances, will drive future innovation, and interdisciplinary cooperation must inform that content. The technology for taking students on a simulated tour of the Louvre, for instance, exists, but art historians first must put the virtual art on the walls. "The spaces between the disciplines are where creativity emerges," said Ash Black, a data scientist and executive director of Tech Global in the UA Office of Global Initiatives, who moderated the panels. Rodriguez spoke to the possibilities for creating content. "It's a bit terrifying and exciting that I, a mere student, can develop things," she said. Working with a chatbot integrated into a 3-D model, Rodriguez said the technology is easily accessible, even to the untrained programmer. Virtual reality is playing an increasingly important role in education and training, from modeling life-saving emergency evacuation procedures to creating art that forces us to ask questions about who we are and how we interact with our environments. "It allows us to experience things we couldn't – and hopefully will never experience – in the real world and go places we haven't been before," Jun Son said. Virtual reality also can act as an early warning system, Farbrook said. "When we put on the headsets, we are accepting a constructed reality – an alternative reality – and the danger is that there is a point at which we accept that alternative as real," he added. "We have to be careful, see how far we can go, and then decide not to go there." For more information about how VR is being used on campus, contact Jennifer Nichols, University Libraries, at jtn@email.arizona.edu.